When you start to look at water molecules by themselves they do strange things, but when you start to put them together and observe them at the microscopic level things can get a whole lot weirder. According to the research of Dr. Gerald Pollack of the University of Washington water has a 4th state of matter after liquid, ice and vapor. Welcome to exclusion zone water: H3O2. Why does only one cloud form in the sky at a time if a whole ocean is evaporating? How does high voltage allow bridges of water up to 4cm? How do our bodies hold together if we’re mostly made of a liquid? It turns out water structures itself into a crystalline membrane of H302 in response to hydrophilics, magnetics, light (infrared mainly), electricity, temperature and possibly more. 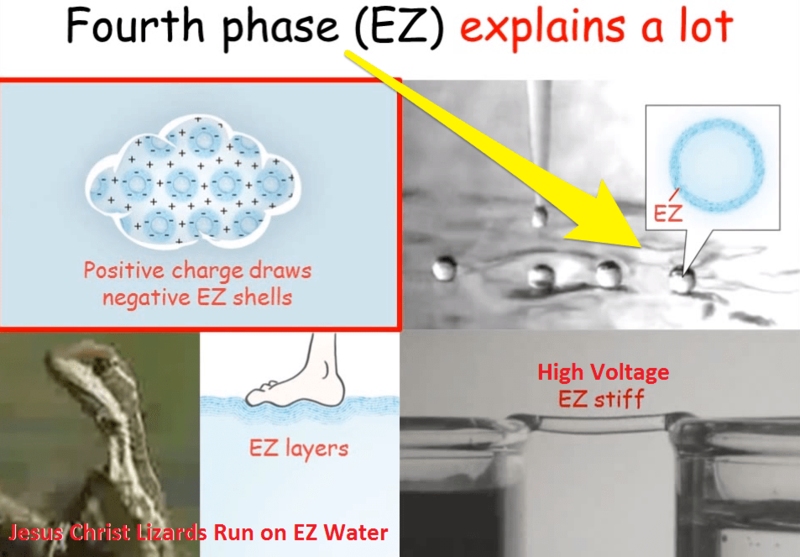 EZ water may prove to be one of the greatest discoveries of water’s secrets.